found this crayon in a new box of crayons belonging to my son, it is lemon yellow, but not proper crayola. a cheap copy. the name is there though, so I thought I would photograph it (at dusk, so not very good pic). It is this weeks colour for Happythings new year of colour, I missed white last week, and may only remember to take part sporadically, knowing me, but I will try. There is very little yellow in my house, I did walk round and have a look but nothing sprang out at me. My bedroom as a teenager was yellow (lemon yellow!!) but I think I have rebelled against the colour ever since. Love the lemon yellow and the inspiration of color! 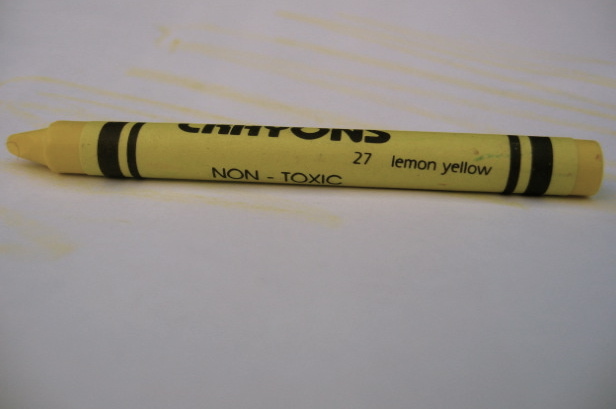 Oo - I was hoping you found a real lemon yellow crayon. Well, knock off or not, good job!